After I sign up for a dedicated Mac, what happens next? Due to the potential for delays, we recommend that all new users first subscribe to a Mac mini with instant availability to test network connectivity, latency, and the speed of the hosted Mac. If you selected a server with instant availability (e.g. a Mac mini running macOS 10.12), you will receive an email after subscribing containing the access instructions. For custom orders (hardware, networking, or operating system), our technicians will begin configuring your server upon checkout. This can take up to 24 hours or longer in some cases of limited parts availability. Can I change the OS on my server from macOS to Linux? One of the benefits of the hypervisor is the ability to install multiple operating systems on one system. If your subscription is a Mac mini with quad core i7 CPU, you can run multiple virtual machines with various operating systems on the server. In the past we installed the VMware ESXi hypervisor and created a Linux virtual machine by request. Due to the complex nature of installing Linux and the many variations available, we now offer the base VMware ESXi installation with no virtual machines included. Customers may install virtual machines on their own. We don’t do any initial operating system customization. When you initially order a server with macOS on it, it's macOS on the bare metal Mac just as if you’d bought it at a store. Can I run a Daylite server on a hosted Mac? Yes. With a server at MacStadium, you’ll have access to a dedicated Mac in a data center to host your Daylite server and can be online in a matter of a couple hours. By taking advantage of external storage, you can setup automated Time Machine backups of your Daylite server to protect your data. Read more on our Daylite landing page. Since you have control of the whole server, you can use it for other services, too. Along with Daylite, you can also host your website, file sharing, mail server, etc. Can I use a remote Mac for iOS application development? Yes, our service is popular among individual developers and large teams developing apps for iOS. Certain forms of application development require that a physical iOS device is connected to emulate and test the application. This can be done over the wire (across the internet) using a USB over IP solution. One common solution that other customers have recommended is Eltima's USB over Network for Mac software. Can you assist with the configuration of my Mac? Our remote hands service covers basic hardware and OS setup to ensure that you can gain access to your Mac via remote SSH, VNC, or Screen Sharing. We are a fully-staffed service organization with technicians and engineers available around the clock - many of whom are highly trained on solutions which involve Apple hardware. If you need further, more-specific help setting up more detailed aspects of the OS or included software, we will try to help if we can provide guidance. But, MacStadium is an infrastructure services provider, and not an IT support organization. For this reason, we often refer more advanced support issues dealing with custom configuration of your OS or software to one of our partners who specialize in IT configuration and management. Do I have root and admin access to subscription-based Mac servers? For every subscription to a hosted Mac running macOS, we provide an adminstrator account and the ability to modify system-level files. Login as administrator to a Mac running macOS and you have complete control over the system. SSH and VNC access are enabled by default on dedicated servers so you can access them from any device. It's no different than if the server were on your local network. We do require that you follow the guidelines set in our Terms of Service and Acceptable Use Policy which you must agree to during checkout. Do I need a VNC server installed on my Mac? One of the more popular free VNC tools used by our clients, RealVNC, now offers their server product under the name VNC Connect. Customers often ask us whether they need VNC Connect on their Mac running macOS. Apple’s macOS also includes a built-in default VNC server. We enable this for every hosted Mac running any version of macOS before releasing the server to a customer. To connect to one of our Mac servers running macOS, you need a VNC client like the one RealVNC offers, VNC Viewer. VNC Connect is not required. Does MacStadium offer a hosted iMac Pro? Not yet, but soon! We're still finalizing some aspects of the offering, but an iMac Pro private beta starts soon. Sign up here if you'd like to participate in the beta or get updates about the iMac Pro as we prepare for release. Does MacStadium require a server edition of the Mac mini for colocation? The quad-core i7 model Mac mini was previously available in a server variant with redundant disk drives and either the Server version of OS X (up until OS X 10.7) or a copy of the macOS Server application in versions 10.8 and newer. macOS Server can be purchased from the App Store. However, Apple removed the server model from the product offering with the Mac mini update in late 2014. We still offer subscriptions of the quad-core i7 Mac mini with redundant hard drives or with a SSD. For CPU-intensive tasks, the i7 Mac mini is the best value. You are free to colocate any model of Mac mini at MacStadium. See related articles for more details about colocation. How do I connect to my Mac the first time? Once you have connected to your Mac for the first time, you can install other common remote access solutions such as SplashTop, TeamViewer, or LogMeIn. Is the Mac mini a good server? With our custom rack infrastructure, remote hands capability, and network infrastructure expertise, the Mac mini is a viable server platform for any small to medium-sized business requiring managed Apple hardware running macOS in a data center. The Mac mini is an efficient and cost-effective server platform that performs very well with both Intel i5 and i7 CPU options. It holds its own against many other server platforms in its class, and while using less space with a fraction of the power footprint. When Apple discontinued manufacture and sale of the Xserve blade servers, they published an Xserve to Mac mini transition guide sharing a positive opinion on utilizing the Mac mini as a server. Is there macOS software to replace the popular web hosting software offered by Linux VPS providers? Below are some tools that allow users to exploit the power and reliability of the Apple macOS platform, and still have the familiar *NIX-type experience. macOS Server by Apple is available in the App Store for $19.99 and installs as an app and service within macOS. It includes a web server among other utilities. MAMP / MAMP Pro is similar to Linux LAMP. “MAMP” stands for Macintosh, Apache, MySQL and PHP. MAMP can be installed on macOS 10.10 or greater and includes a friendly user interface. MACPorts is a more advanced method that provides a command-line method of installing software packages under BSD to access thousands of ports and greatly simplifies compiling and installing open-source software on your Mac. HomeBrew is the latest BSD/*NIX package manager for macOS, and is a great alternative to MACPorts. The Mac is a powerful Intel-based hardware platform that can run any OS – not just macOS. MacStadium offers VMware ESXi as a means to install all variants of Linux as virtual machines on a hosted Mac. This includes generic distributions like Debian, Ubuntu, and CentOS, as well as packaged distributions that include software like cPanel and Plesk. I’m interested in a single Mac mini… what should I do? The best option is to sign up online with a credit card - you’ll be up and running almost immediately. A dedicated mini will perform almost exactly like a mini sitting on your desk… just with more security, better uptime, and higher bandwidth. There is even a 24-hour trial so you can check performance and bandwidth. What are MacStadium’s proprietary Mac Pro upgrades? Dual power, dual 10G ethernet, fiber channel (which allows you to access SAN in a cloud environment). What is APFS? And what can I do with it? The majority of our customers choose traditional dedicated server hosting where MacStadium provides the server hardware and hosts it in our data center. If you already own a Mac and wish for us to host it for you, you may use our Mac colocation service. In both offerings, each subscription is required to pay a hosting fee each month which includes the Internet connectivity, custom rack space, power, remote management tools, remote hands support, and active DDoS protection. Instant Activation available to dedicated servers, so you can get started immediately. The latest version of macOS is available with no wait on our most popular Mac mini offerings. MacStadium is 100% responsible for all maintenance on the servers. If your Mac has hardware issues, we cover 100% of hardware and labor costs. You can change Mac models at any point during your subscription with no penalties; you’ll only need to pay any difference in price if upgrading. When Apple releases new Mac hardware in the future, MacStadium will offer subscriptions to those models, and you can swap. If you can’t predict the future (most of us can’t), then using our servers makes more sense than owning the hardware yourself. Technology always depreciates. When you subscribe to a server from MacStadium, you don’t have worry about loss of value, shipping fees, or lost productivity time. Businesses prefer to have an operating expense on the books vs. a capital expense for accounting reasons. Why are coreaudiod and launchd in macOS using a high amount of resources? Disclaimer: We are an infrastructure provider and can only offer a minimal amount of help for software issues. We can not guarantee this fix works for all users or offer support for it. Please contact the software developer (Apple, in this case) for further help. We can also provide a list of vendors that we work with to support you. Once blued is running properly, coreaudiod and launchd both settle down." Why won’t Java install on my hosted Mac? Java looks for an actual display plugged into the Mac mini in order for it to install without error. However, none of the Mac servers in a data center environment like at MacStadium have physical displays connected. As a solution, we have verified that installing a GPU enabler dongle — which we include as a free add-on to all Mac subscriptions — will convince macOS a display plugged in. This allows Java to install without error. Other benefits of the GPU enabler dongle including performance improvements and increased resolutions are noted in our blog. Can I host non-Mac hardware with you as well? Keep in mind that you can run any OS on Mac hosts! However, if you have a lot of non-Mac workloads, we can also add HPE Blade infrastructure to your environment. Many customers use this for Android builds and testing. What components are included with every Mac Pro in a private cloud? 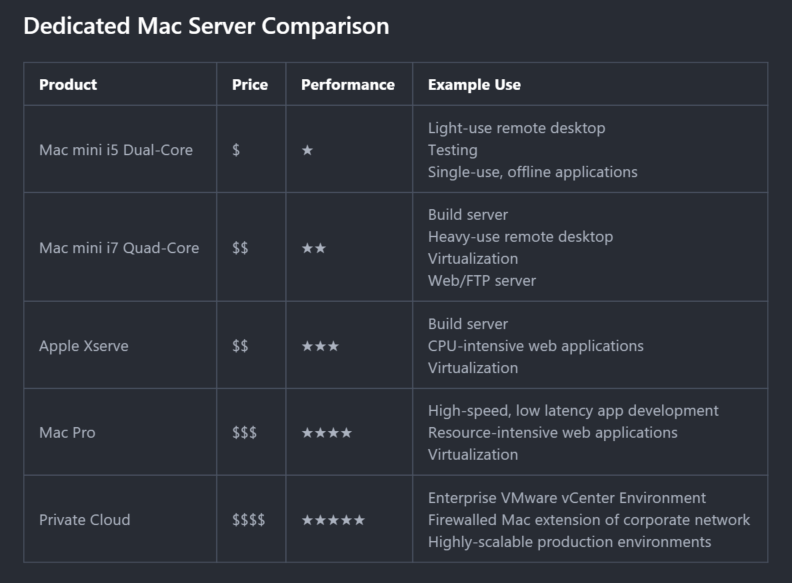 When part of a private cloud environment, each Mac Pro includes the hardware, MacStadium upgrades, hosting, and VMware. In addition to the Mac Pro(s), each cloud includes a firewall, vCenter, IP block, SAN (or internal drive), and a cloud bundle discount. What is covered in the price of a private cloud? All of our cloud environments are highly secure and hosted in Tier III and IV data centers. We add patented technology to each Mac Pro. We monitor and maintain all hosted hardware. You get access to 24/7 expert Mac networking support. You get a dedicated account manager that can help you with any issues. You get unlimited bandwidth. What is the best environment for me? Most of our customers choose a private cloud. A hosted private cloud has the most flexibility, scalability, security, and performance. We also offer individual dedicated Macs if you do not need the scale of a private cloud. Can I visit MacStadium data centers? You are welcome to request a visit to our facilities either before you are a customer, or during your subscription period to learn more about our services and solutions. Open a ticket or give us a call to arrange your visit. We’d also love to host you at our headquarters in Atlanta to talk about large-scale solutions and tour the facility. Our sales engineering team is available to schedule a visit at your convenience. For decades, large corporations requiring always-available computing and data storage resources have housed their computing resources in secure data centers to ensure maximum uptime and availability of their equipment and information. If you have computing equipment hosted in a data center, then it is stated that you are co-locating your equipment in that facility (colo and colocation are the recognized terms). By hosting your Mac at MacStadium, it will always be available for you to access remotely via screen sharing, VNC, or command line interface from anywhere on the internet. Many of our clients use their Macs for game servers, web hosting, database hosting, off-site backup, email hosting, or any other applications typically run on macOS. You can also use your Mac as a Windows server, BSD Server, IP PBX, or any other variety due to its industry standard Intel-based hardware platform. What kind of servers are hosted at MacStadium? We are serious about our infrastructure, and have made significant investments to ensure that MacStadium facilities are the best Mac hosting solutions available. We have premium seating for both new style Mac minis (2010 – Current) and older style Mac minis (2009 or prior). Each patented, proprietary rack in MacStadium data centers holds 460 Mac minis contained with all cabling, power management, and network infrastructure. We’ve designed a custom enclosure and rack mount system to house the 2013+ cylindrical Mac Pro. Learn more about our rack solutions that allow us to rapidly scale private cloud environments on our data centers page. Besides our main dedicated server and cloud offerings for the Mac mini and the latest-generation Mac Pro, we can host Apple’s rack-mounted Xserve line. We also offer traditional HPE blade infrastructure for organizations with a desire to house all of their services in one enterprise solution. If you have a special project, please give us a call! We specialize in custom configurations (like consolidated hybrid cloud environments and isolated cages). Our engineering team loves to work with customers to create bespoke enterprise solutions. Call our sales engineering staff today to learn more. Which location should I choose? When choosing a data center to start a subscription, keep in mind the geographic locations of all those attempting to access the server (that could mean you, your team, or your customers). If low latency is important, the closer the servers are physically, the better your connection quality will be. Can I connect to a hosted Mac from behind my office firewall? If need to create a private connection between your office and a hosted Mac or private cloud at MacStadium, we provide two types of firewall access. We offer access to our managed, shared firewall for $50 per month. Engineers at MacStadium will consult with you or your IT experts to configure and maintain your subscriptions behind this firewall. Our managed, shared firewall solution is built on Cisco ASA hardware. Our top-level solution is a dedicated firewall or pair of dedicated firewalls from the Cisco ASA 5500 series. This solution will initially be initially configured by our network engineers before being turned over to you to be self-managed by you or your IT staff. We’re happy to assist with future configuration if you’re unfamiliar with Cisco ASA solutions. Create a permanent VPN tunnel between corporate office Local Area Network and servers located at one of the three MacStadium datacenters. Enable ports for remote access to allow remote users to VPN into their MacStadium servers. Establish extensive firewall policies, protecting and securing their servers from the internet as needed. This is often preferred over software firewall policies which are placed directly on the servers. Managing a firewall at the network level in front of your hardware is easier to configure and troubleshoot when multiple servers are involved or when many locations are being connected. Some of these solutions are only available with the dedicated hardware option. Our sales engineering team can further explain your options. Can we securely connect to our MacStadium servers by whitelisting the public IP addresses? Do you need secure remote (SSH, SFTP, etc.) access to or from your MacStadium servers to machines at a third party provider like Amazon Web Services, Google Cloud Platform, or Microsoft Azure? Your public IP addresses are yours to use and are not shared. Once assigned to a subscription or account, they are not used for any other purpose. You’re free to whitelist those IP’s on your remote AWS, GCP, or Azure servers for remote access to your MacStadium dedicated servers and/or virtual machines. How can I enable file sharing between multiple dedicated servers? We can either place your dedicated servers in a PVLAN community where your IP addresses would not change or setup a dedicated VLAN with a new, dedicated subnet. The PVLAN option is free. With the dedicated VLAN you would have to pay per month for the size subnet you desired. You can open a support ticket to have either option configured. For dedicated servers, we provide complimentary real-time and historical network usage graphs at the port and network edge in your customer dashboard. Usage is calculated hourly, daily, weekly, and monthly for you to monitor in real time. If you are on a bulk plan with many servers under a single invoice, we can not guarantee access to the network usage graphs. Customers with private cloud environments will not have access to the network usage graphs in their customer dashboards. Instead, we will provide complimentary access through Logic Monitor to track usage on all available resources in your environment. How secure is the connection to servers at MacStadium? MacStadium’s engineering team has spared no expense in providing a variety of standard and optional, premium security measures. Read more about our firewall options and our security practices. We do not throttle or groom network traffic in any way. Whether your servers are on the Pro or Elite hosting plan, you’ll get full 100Mbps or 1000Mbps, respectively, upstream and downstream. All connections are also by default wide open. We do not block any ports on servers at the time of configuration. What is a PVLAN/VLAN? Can I have one configured for multiple data centers? As a best practice and for network stability, it is recommended to limit layer 2 size to a single geographical location. A PVLAN or VLAN is a layer 2 configuration. Layer 2 does not and can not extend between data centers. When customers are in different data centers they should be able to inherently communicate between each other like any two servers on the internet. Public internet connected servers will not be able to see each other as if they are on the same LAN segment. What web service can I use to check the speed of my server? We recommend using beta.speedtest.net. It’s an HTML5 version of the popular speed test tool by Ookla. We’vealso tested other services like speedof.me in our data centers and have seen issues with accuracy and consistency based on the tool as well as the internet browser used (e.g. Safari vs. Chrome). We have also written about speed tests in the past. In our blog, you can review our Hosting Elite Gigabit Speed Test and Hosting Pro 100Mbps Speed Test benchmark videos. Why can't my servers talk to each other? If you have multiple servers at a single MacStadium data center and wish for them to "see" each other without touching the public internet, a Private VLAN (PVLAN) or Virtual LAN (VLAN) can be created to enable this. Open a support ticket and our engineering team will explain the options based on your current account and subscriptions. By default, dedicated and colocated servers are not able to communicate or “see” each other on the layer 2 network within a single MacStadium data center. This is to isolate customers from one another and facilitate security. Why do I have recurring issues connecting to my colocated server running an older version of OS X? There is a network issue related to ARP in OS X which causes significant packet loss in redundant Cisco Networks. If you are running OS X 10.9 or 10.10 on a Mac mini colocated with us, this issue needs to be patched in the OS X networking stack. You can find a tool in your customer dashboard that allows you to check the status of and apply the patch at any time. Can I add SAN storage to an existing server? If your existing server is a Mac Pro running VMware and you wish to add SAN storage, this is possible. We’ll need to take the server offline for a short period to present fibre channel connectivity to it. There is no additional labor cost when adding SAN at a later date. Available add-ons for your server are accessible within your customer dashboard under the Add-Ons tab within the details of your subscription(s). If you have a Mac Pro server running an operating system on bare metal (macOS, for example), we can’t provision SAN storage for it. Due to the configuration and storage type, the operating system is unable to connect to and manage SAN storage. Can I use internal SSDs instead of SAN storage? Yes, but there are some things you should know. The bandwidth on internal SSDs is great, and it’s a cheaper option, but there are some serious limitations/considerations you should be aware of. There is no redundancy with internal SSDs. If a drive dies, it’s dead and all information is lost. If you use internal SSDs you lose the ability to do resource pooling - each VM must run on a single host and the associated internal SSD. This also prevents you from running hosts in an HA configuration on large clouds. With internal SSDs you are limited to 1TB/host. Our small cloud bundles use internal SSDs by default. What RAID configuration is used in the 2xHDD Mac mini configurations? By default, Mac minis with RAID arrays are set to RAID1. That means the pair of drives are mirrored for availability. If you’d like a different RAID configuration at the time of your order, please open a support ticket with your request. Our support staff can also handle custom requests. One popular, virtualization-focused option on the Mac mini with quad core i7 CPU is removing the RAID array and replacing one of the disks with an SSD. The user can then install VMware ESXi on the SSD with a few high-performing (or all) virtual machines while using the remaining HDD for low-performance virtual machines and/or backup. RAID in any form is not a backup! RAID provides availability or speed based on the format. If you lose a disk in a RAID1 array, you have another disk available to rebuild the RAID array after adding a new disk. Other forms of RAID offer lesser or greater amounts of availability by way of parity. The standard RAID levels page on Wikipedia is a great resource for learning more. Pure Storage provides super high performance all-flash arrays. They are highly reliable with built-in redundancy so you never experience data loss. In addition, they have unparalleled throughput capabilities and built-in hardware encryption so your information is always secure. We find that this level of performance is important for cloud customers doing Mac CI/CD. How does MacStadium help with continuous integration (CI) projects? iOS and macOS developers practicing CI/CD require dedicated Mac hardware to build and test their apps. We provide this service for everyone from individual developers to growing startups and Fortune 100 organizations. Whether you want to get started with Jenkins on a single Mac mini, manage multiple Mac servers running a Buildkite agent, or deploy a hosted Mac Pro private cloud running VMware for large-scale CI and CD, MacStadium has a solution for all iOS app development and testing needs. We can provide a cluster of Mac servers, SAN storage and a managed firewall -- everything you need to create virtual machines to test and build on for CI. Our cloud solution is highly scalable and redundant. Can I change hosting plans? Yes, we can move your Mac mini from one hosting plan to the other at no cost to you. This only applies to the Mac mini, since the Mac Pro is available solely on the Elite+ plan. Customers may login to their customer dashboard and open a support ticket to request this change. A change of hosting plans requires physically moving your server to a new rack slot. Your server will experience minor downtime during the move. Within your request ticket, we’ll work with you to reduce downtime via scheduling. We will prorate your hosting charges that month based on the number of days your server spends on each hosting plan. Can I get a copy of MacStadium's IRS Tax Form W-9? A signed copy of MacStadium’s Form W-9 for IRS tax purposes is now available on our legal page. Please email billing@macstadium.com if you have any further questions. We accept PayPal with a pre-payment of three (3) or more months of service. Please open a ticket with the billing department to setup your payments using PayPal. Yes. However, we do require payments of at least $1,000 for invoicing. If your monthly price is less than that, you can still receive an invoiced payment by pre-paying for one or two years. How can I reactivate my cancelled Mac subscription? In order to reactivate a Mac, log into the MacStadium Portal and select the previously deactivated subscription. To do so select the Actions button on the right of your subscription overview and select Reactivate from the drop down menu. A ticket will be automatically generated for our engineers to execute and you’ll be notified once your Mac is accessible again. You can find more information here. How do I add more team members to my account? Using the MacStadium customer dashboard you’re able to add multiple team members to your account and apply user-specific permissions to them. This allows you to grant access only to certain parts of the customer dashboard. For example, you could add someone of your accounting department to your account and only allow them to see accounting related parts of the dashboard. If you would like to add another team member to your MacStadium account please first log into your customer dashboard. Once you’ve done that locate the silhouette of a person in the top right corner and select Team Member. From there you can add a new user using the New Team Member button in the top right. The Phone Number field is not required to be filled in. Once you’ve added your team member to your account, our system will send an activation link to the specified email address allowing them to set a password for themselves. From the Team Member page, you can edit a team member's information and permissions by clicking the "Edit" button. You can also archive a team member if you no longer want them to have access. To view all archived team members click the "Show Archived" checkbox. How do I end or cancel my subscription? You don’t need a lengthy contract to take advantage of Mac hosting at MacStadium. We bill on the anniversary date of your subscription each month for the next 30 days of service. If you ever decide to leave MacStadium, you can do so through your customer dashboard. To cancel a single subscription, open its details, click on the Actions dropdown, and then click Cancel. If you have multiple subscriptions and want to cancel your account, please submit a support ticket. This can be completed at any time for any and all subscriptions you no longer wish to use. When you cancel a subscription, the server is taken offline and all data is destroyed. If you cancel your subscription before the end of your current service period, we do NOT refund any amounts already paid for service in the future. In accounting terms, we don’t prorate services at MacStadium due to the man-hours required to return used hardware to inventory for re-use. If you own the Mac on the canceled subscription (because you shipped it to us as part of our colocation service), we will return your server to you after verifying the shipping address and speed of shipment requested. Our billing department will charge your payment method on file the actual shipping amount to close out your billing. You’re always welcome to return at any time with the same account. How do I remove/archive a team member from my account? If you would like to remove access from a team member, please first log into your customer dashboard. Click on the silhouette of a person in the top right corner and select Team Member. From the Team Member page, you can edit a team member's information and permissions by clicking the "Edit" button. You can Archive a team member if you no longer want them to have access. To view all archived team members click the "Show Archived" checkbox. How do I share my account details in a support ticket? The simplest solution is to add them in the support ticket via our secure web interface. For additional security, we have also added a checkbox labeled Contains Sensitive Information which prevents the text being sent in your ticket note from appearing in any plain text emails - you and your team members must sign in to the customer dashboard to view the message. You are also free to change the credentials after we are done assisting you. What is a billing master? For customers with a large number Mac servers, it’s far easier to combine your monthly expenses on one statement than to bill you for each subscription individually throughout the month. We offer a billing master subscription to cover this situation. A billing master subscription combines all of your subscriptions and their components into a single placeholder subscription so you receive a simplified and bundled billing statement that makes account management much easier. This allows us to bill you once per month for all of your subscriptions, even if you add servers or add-ons at different times throughout the billing period. Read more about billing masters. Where can I access my invoices? Invoices for your individual subscription(s) are available in your customer dashboard in PDF format under the Billing tab within the details of your subscription(s). Each subscription has its own statement. For large numbers of servers, please get in touch with the billing team to discuss options for condensing billing statements. Why was my credit card declined during the signup process? At MacStadium, we make use of fraud protection services that use multiple layers of security to identify and stop fraud before it happens. These measures are in place to help ensure the security of our network and the best possible experience for our customers. Because of these additional security measures, it's possible that your credit card transaction could be flagged by the system during signup, even if the credit card is valid. If this happens, please contact us via phone, chat or open a ticket in your dashboard. Read more about this topic here.